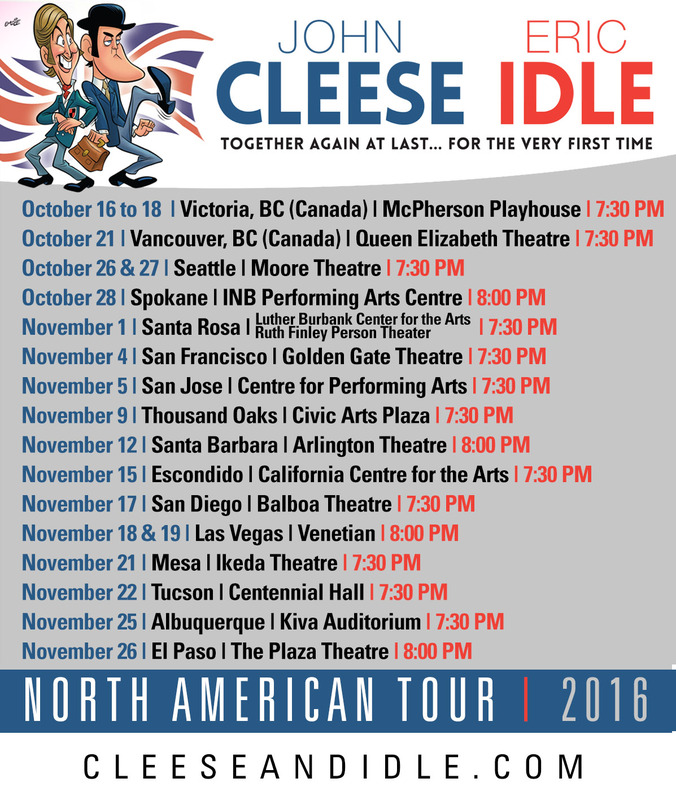 John and Eric will be returning to North America with their tour “John Cleese & Eric Idle: Together Again At Last...For The Very First Time” in October, this time taking on the Western part of the US along with a couple of cities North of the border (lucky Canada!). Following a successful run last fall in the Eastern US as well as a sold-out run in Australia and New Zealand this past February, John and Eric will bring their show to some of the warmest (and driest) territories the US has to offer. The tour will take place from October 16 to November 26 at premiere venues in Victoria, Vancouver, Seattle, Spokane, Santa Rosa, San Francisco, San Jose, Thousand Oaks, Santa Barbara, Escondido, San Diego, Las Vegas, Mesa, Tucson, Albuquerque, El Paso with additional markets to be announced soon. Eric said of the announcement: "I'm very much looking forward to touring again with John. We're together again at last for the very third time!" John said: "Now that we’ve toured the South East of the USA, we pretty much know some of our lines. But no two shows will be the same. In fact, not even one show will be the same. Just two long-drawn-out hours of sit-down comedy, with a only a few embarrassing silences and bathroom breaks". Tickets go on sale on Monday 20 June, but a pre-sale starts today, password PYTHON. For full tour dates and links to tickets visit here. “In Together Again At Last...For The Very First Time”, John and Eric blend scripted and improvised material with storytelling, musical numbers, exclusive footage, aquatic juggling and an extended audience Q&A.